TPE stands for "thermoplastic elastomer". This product family consists out of different formulations which are elastic but with temperature increase become fluid and thus processable like thermoplastic. 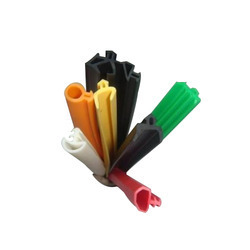 They comprise the easy processability of thermoplastics with essential properties of rubber. Due to their mechanic and physical properties they have a broad application field. Thermoplastic Elastomer Profiles is a New Product from Osaka Rubber, Which is a TPE material that processes like a thermoplastics, but has the physical properties of a thermosetting rubber. Besides conventional vulcanized rubber, it delivers superior properties to make replacement application of rubber and soft plastic in the sense of processing and end uses. Note: The Prices of the product varies as per the drawing , design, dimension & specification of product.